"It has always seemed, to those of us who know Ronald Colman well, that half of the complete explanation of the enigma of him lies in the discrepancy between the characters he plays on the screen and the character he is in private life. There is something significant in the fact that, wishing to avoid all exhibitionism in his private life, he plays such swashbuckling characters on the screen. 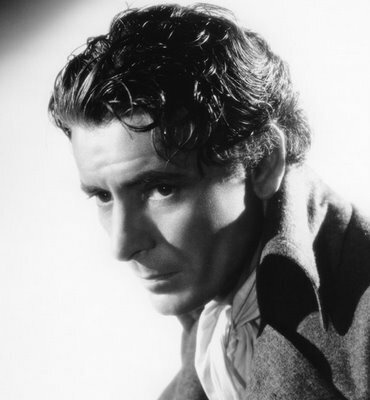 For, if you think back over a couple of the Colman pictures - 'Bulldog Drummond', 'Beau Geste', 'Under Two Flags', 'Clive of India', 'The Prisoner of Zenda', and most recently 'If I were King' - you cannot but realise that Ronald Colman always plays the parts of spectacular, adventurous men. As he is a freelance - which means that he himself chooses the stories he wants to make for the screen - it is fairly obvious that he deliberately chooses to play exhibitionistic characters. "This is, Mr. Colman agrees, a point well taken. He said, 'Perhaps the contradiction can be further explained by my admitting that if ever I am called upon to make a speech at an affair which I am attending in a private capacity, I am sunk, miserably self-conscious, regrettably inadequate. If, on the other hand, a script calls for me to do a scene in which I must stand up and harangue a thousand extras, I can harangue away for hours and think nothing of it. Which simply means, I think, that as an actor, I am neither inhibited nor self-conscious, whereas in my own capacity as a man, I am both. "I'm not much of a hand at analysing myself, but I have heard of split personalities. Perhaps, in my case, the split comes between my screen self and my real self. I've never thought of this before, but it now occurs to me that I may have become an actor so that I could pretend to be the kind of fellow I cannot be in real life. Trying to explain why the sword-swallowing hero I like to play on the screen is so different from my unexeciting self is, for me, a task almot too difficult to attend. I is a subject about which I know very little. I am not given to introspection. The majority of my interests, apart from my work, are active interests, such as tennis, gardening, sailing. Which indicates, if I understand correctly my cursory readings of psychology, that I would be classified as an extrovert. My way of living, then," concluded Mr. Colman, "probably does date back to my childhood. Certainly I learned, very early in life, that to make myself as unobtrusive as possible was to make myself as popular as possible." 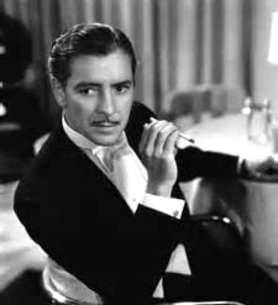 BORN in Richmond, Surrey, England, Ronald Colman was the fifth child in a family of six children. Now a fifth child does not occupy any particular spotlight in the family circle unless he is in some way exceptional, which, Ronald insists, he was not. and Edith (born 1885), girls in their teens when Ronald was in the nursery. Next to the sisters in age came Eric; two years later Ronald was born. So that, just at the age when the small Ronald was beginning to feel the shape of his own individuality, the sisters were at the ages when their beaux and activities demanded — and got — the major portion of their parents' attention. A small boy is never considered an asset by girls in their teens and Ronald was no exception to this rule. Moreover, Eric's two years seniority placed him in a position of overlordship to the smaller brother, while Frieda, born when Ronald was three years old and destined to creep into his heart and affections as his best friend and constant companion, was, at first, just another reason for a small boy to be as quiet and out-of-the-wayish as possible. It is obvious, then, that the family set up could not have contributed very much to the boy's sense of self-importance. Charles Colman, the father and very much the head of his family, was of the old school which holds that children should be "seen but not heard". Ronald, as a small boy, was devoted to his father, but, admittedly, a little frightened of him. Marjorie Colman, whose maiden name was Fraser, was, as mothers usually are, softer, more yielding than the father. Such confidences as the naturally reticent boy gave to anyone he gave to her. But the family was large and the differences in the ages of the children made too many demands upon the mother for her to be able to concentrate for any length of time on any one of her brood. Ronald does not seem to recall feeling any lack in his life because of the impersonal bustle of the household. He was, if anything, vaguely grateful for it. He preferred to be alone. He liked to keep his thoughts to himself. He even insisted upon saying his bedtime prayers to himself, feeling very silly indeed when a nurse or one of his sisters or even his mother came in to overhear his devotions. So, from infancy, we discover, he guarded his privacy as a precious and inviolable possession. Once every month Charles Colman took one of his sons up to London with him to visit his offices in that city. One month Eric would go with his father, the next month it would be Ronald's turn. The object of these pilgrimages was the father's desire to implant an interest in his business in one, or both, of his sons. The elder Colman was an importer of silks from the Orient. And the business was thriving enough to supply the family with all of the comforts of living, a few of the luxuries. "I enjoyed those trips to Father's offices tremendously," Mr. Colman remembers. "They stimulated my imagination as nothing else did. And my imagination needed stimulating, for I was not a very imaginative child. I didn't care to read fairy tales. I didn't believe in fairies or, indeed, in any thing I couldn't see, touch, hear or taste. I remember being told by my nurse that a certain house in our neighbourhood was "haunted' and my reply was a matter-of-fact, 'Nonsense, it just needs a coat of paint!' I had none of the dreams by day or nightmares by night which delight or terrify the highly-strung child. Nursery tea was, I am afraid, the high spot of my day. Towards buns and tea and jam were all my dreams directed. And I was ungallantly displeased when I was told that the muffins and tea must be passed to Frieda first 'Because she is a girl'. I saw my first motion picture with my father, too. It was my eleventh birthday, I remember, and Father took me to the old Earls Court Exhibition. It was a catchpenny show, with bands, whirligigs, fortune tellers - a very dreamland of noise and excitement and innocent baits for suckers. I loved it. And here again my childhood 'conditions' my maturity. For I have never outgrown my passion for amusement parks. Whenever Noel Cowards in in Hollywood we always give one evening to the Venice Pier at Santa Monica, where, Noel sharing my enthusiasm, we 'do' the merry-go-rounds, shooting galleries, ferris wheels and so on. "But those years ago at Earls Court Father and I came upon an attraction which was new, at any rate to me. Over a cavernous entrance we saw a sign which read: 'Animated Pictures'. What, I thought, were they? "We paid our admissions and went into an inky-black pit. Directly before my dilated eyes an express train was running out of the tunnel and heading straight for the bench upon which father and I were seated. The sensation it gave me of narrowly escaping a violent death did not seem to me to come under the heading of amusement. Father laughed when, safely out in the open air again, I told him what I thought of this divertissement. Then he said, 'This invention has a future, son, watch it. It is going to make the fortunes of a great many people'. "Why I remember those words so exactly all these years later I can't say. Because at the time they seemed to me to be pretty silly. If that invention was going to make money for people, I thought, I would not be among them. When we got home I told Frieda about 'the pictures that move' and earnestly advised her to stay away from them!" In the mind of the grown man those early days in Richmond blend into a comfortable pattern of days spent in the garden with Frieda where they shared such projects as rearing expanding families of guinea pigs, making rabbit hutches, digging holes in the earth in the belief that they would reach China. "Quite frequently an animal masticated the thermometer," chuckles Mr. Colman, "whereupon the 'doctor' became a skilled mortician! 'Of course I went through all the normal phases of wanting to be a cabby, a fireman on a train, a captain of a cargo whip when I grew up. Frieda and I agreed that it would be pretty fine to see me sitting up there above the heads of my fares, cracking a whip and wearing a battered topper. I also hoped to become a fireman on a train. I was thrilled whenever I saw an engine roar past me in the night, the fires stoked by a stalwart, half-naked man who bent and rose again in the flames as he fed the gigantic bowels of the monster. I felt a very little colourless person, by comparison. Even then, you see, I 'admired' to be a man of venturesome, violent action." Yes, it was certainly a comfortable, rather commonplace childhood that the small Ronald led in the bosom of that busy family life, on the bosom of the rich-earthed countryside. And it was the kind of a life which, in no sense prepared him for the Hollywood life, the Hollywood ways. The family lived well, but carefully. The girls had their 'best dresses', the little boys had 'Sunday suits' and were taught to keep them carefully brushed and hung away against 'special occasions'. "We always had plenty of everything but we were aware that there were limitations. We had plenty of play things, for instance but few duplicates. So that when Eric had a bike he had to share it with me and when I had a cricket bat I had to let him have his turn at it. We learned to share and share alike as a matter of course. Which rather gave us the idea that one fellow is not supposed to have more than the other fellow. "But that they were happy years, those early years, of this I am sure. Because we never thought about whether we were happy or not. It is only when we are unhappy that we give any thought to it." Charles Colman did when Ronald was sixteen. His going was not only a deep personal grief to each member of his family, but added to the grief was a complete upheaval of the familiar way of living. For the father's death considerably reduced the family circumstances. Ronald was recalled from the Hadleigh School of Littlehampton, Sussex which he had been attending. And there was no further talk of preparing him for Cambridge or Oxford. "Leaving school was no great blow to me," Mr. Colman told me, "although I liked school well enough. I liked it because I felt a certain self-confidence when I was in the schoolroom. It is the same kind of confidence I feel now when I am on a sound stage in a studio. On the soud stage I am not Ronald Colman, I am an actor with a job to do. In the schoolroom I was not Ronnie Colman, either, I was a scholar with a job to do. When I can sink my personal identity in work, I am always well content. But I had made no close friends at Hadleigh - in fact, up to this point in my life, Frieda and I were 'all the friends' either of us had - there was no Damon to my Pythias at an age when such friendships are most often formed - and so I left the school without an emotional wrench, since the ties of the mind break less painfully than those of the heart. "Soon after my father's death, we removed to the outskirts of London and I began the job of job hunting in the city. I was completely lacking in aggression. I was one of those unfortunate people born without a conspicuous vocation. I didn't know what I what I wanted to do or to be. I was willing to do the first thing that turned up. In fact, that is what I did do. For, while I was waiting for one of my applications for a clerkship to be answered, I ran into a chap I knew who asked me how I'd like to do some amateur acting. He explained that I might get a chance in some of the plays being produced by the Bancroft Professional Club or the Wyndham Stage Society. These clubs were the vogue in London at that time. A group of would-be actors engaged the services of a professional director, the director coached the amateur actors and the plays were put in for short runs at such theatres was were available. "I thought it might be 'fun' to act. So I played juvenile roles, atrociously, I am sure, in such pieces as 'Charley's Aunt', 'The Admirable Crichton', 'The Private Secretary' and others. It was amusing. But I had not the slightest idea of becoming an actor. There was in my mind an instinctive barrier against such an idea. I think my father would have hated it had he known. "I went to the theatre quite often in those days, too. And I suppose that the great personalities of the London stage then, Mr. Lewis Waller, Charles Wyndham, Forbes-Robertson especially, influenced me more than I realised. But it never occurred to my conscious mind that I had anything in common with their world. Any more than, looking through a telescope, I thought I had anything in common with the workings of the zodiac." In course of time, one of Ronald's applications was accepted and he became an office boy for the British Steamship Company at a salary of half a pound a week, some two dollars and fifty cents in our money. He was then seventeen years old. There followed three "inexpressibly dreary years" during which time he worked his way up to the post of junior accountant. This rise in the world was made manifest by his enthronement upon an ancient three-legged stool placed before an old black desk. And by raises in salary which, after three years, gave him and twelve and one half dollars a week. He says now, "My demands on life must have been very modest, for I remember thinking that it was all deadly monotonous work but that otherwise I was doing very well." During this time the young man continued to play in amateur theatricals for the Bancroft Dramatic Club and undoubtedly his escape into the world of make-believing made his office work endurable. He found other escapes, too. He began to read in real earnest, and hungrily. He read Shakespeare and the vigour and vitality of the bard came through to him, quickening his blood, giving him an awareness he had not had before. He read Scott, Bulwer-Lytton, novels, biographies, the odes of Keats, the sonnets of Shelley and discovered a rich, abundant life. He extended his his interests and activities in other ways, too. He enlisted in the London Scottish Regiment, an organisation similar to the National Guard in the United States. And in the regiment, for the first time in his life, he made friends of his own age. "I was shy with girls until I was past sixteen," the man whom Hollywood has called a "woman-hater" will tell you. "But when I became an office boy, I discovered that it was more comfortable to do as the Romans did, to be one of the fellows. And, to be one of the fellows, a chap had to talk about girls and dates and necking parties. To this end I went to a few subscription dances given in and around London, accepted a few invitations to dances in the homes of girls I met. Now and again I took a girl to dinner and the theatre. The chief profit and pleasure I derived from these excursions, I must ungallantly admit, is that it gave me the right to talk like the other fellows." But the adolescent heart of the young Colman was, save for the brief brushing of a dream, left untouched. He did become enamoured of a girl who lived in his flat building. She was blonde and blue-eyed and not much more than a child. And he never got past the stage of silent adoration so that she is no more than a picture framed in his mind. But, as a picture, she remains unfaded. At the age when he might have been romancing, going about socially, he was at first too shy, then too short of funds; then, just as he had begun to overcome these drawbacks - the War came. ROMANTIC RECLUSE BY Gladys Hall. 1. "Romantic Recluse: The Private Life of a Public Hero: Part One".